Back in the Middle Ages, churches helped support their work by selling their parishioners indulgences — forgiveness from sins. These days, many spiritual folk raise funds by offering indulgences of a more earthly variety — such as bake sales and spaghetti suppers. Plenty of contemplative types have a culinary sideline — take New York’s Monks of New Skete, who give Shelburne Farms'; award-winning cheddar its holy smoke. But in Vermont, food for the body and spirit takes some unique forms. But not every devout cook can sell solely to the faithful. Some appeal to the sweet tooth — such as Tim Owings of Killington, described on a website called MonkEGifts.com as “Mission Farm’s resident baker and contemplative.” Mission Farm Bakery is located on the spacious grounds of Killington’s Church of Our Saviour, where Owings came to live in a log cabin in 1997, seeking a simpler life. Before that, he spent a quarter-century baking at the Warren Store and apprenticed under Chuck and Carla Conway, now of Shelburne Farms-based O Bread. That experience shows in Owings’ fruit pies, hermit cookies and festive butter cakes. (The Pear Ginger variety is moist and amply spiked with fennel seeds.) Beside playing organ at Our Saviour, he sells his wares online and to stores such as Healthy Living and Maplefield’s; both food and funds go to church causes like the Rutland County Women’s Center. A bigger, more diversified “soul food” operation is Franciscan Farms, operated by Moretown’s Community of the Crucified One. The church grounds house a rotating group of about 10 residential farmers, cooks and believers who harvest cucumbers, squash, broccoli, eggplant and tomatoes to supply their own catering company, Juniper’s Fare. The substantial greenhouse provides herbs and elderberries to local herbalists and American Flatbread. Juniper’s Fare, which started as a restaurant in Waitsfield, will be reincarnated in March as a gourmet deli at the junction of Routes 100 and 2 in Waterbury. While the Italian cuisine its members prepare is classic, the Community of the Crucified One isn’t the mainline Catholic church its name might suggest. Rather, it’s a charismatic (evangelical) offshoot founded in Pittsburgh in the 1970s by Father Edward Donovan — known to the faithful as “Uncle Eddie” — a metallurgist-turned-priest. This rebellious streak seems to be what attracts followers to the church. From a middle-aged woman covered in tattoos to successful commercial illustrator C. Michael Dudash to a mother and musician who grew up in the church, it draws lots of creative types. Father Paul himself tried transcendental meditation and lived in an ashram before coming to the CCO. When I visit Franciscan Farms, Father Paul is rejoicing in his latest harvest. “We were getting tomatoes from our greenhouse until December 15. You could take them in your hand, rub the skin and smell those big, juicy tomatoes . . . ugh!” he moans beatifically. The nightshades sacrifice themselves for the greater good — tomato sauce, a staple of Juniper’s Fare. At the new café, Father Paul hopes to offer not just soups, sandwiches and homespun Italian food, but also an adventurous localvore menu drawing on the community’s bountiful herb garden. 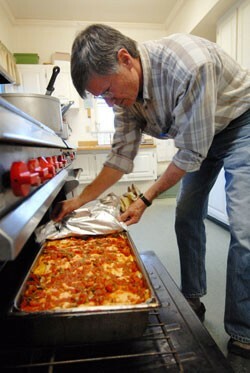 Until then, Juniper’s Fare is serving up hot takeout meals every Friday evening to Upper Valley residents. The pungent sauce also covers the spaghetti with parmesan-heavy meatballs and the lasagnas made with hearty cheese or smoky sausage. As she stirs the sauce, a young woman asks Father Paul a question about the “Book of Knowledge” — not an arcane doctrinal tome, a bit disappointingly, but the binder that holds the church’s recipe collection. As the cooks press me to try their various creations, Martin Smith offers a cup of one of his own herbal tea blends. A New England Culinary Institute grad, Smith returned to Vermont after stints in the California wine country and Boulder, Colorado, to train cooks at NECI Commons and A Single Pebble. After leaving NECI, he worked as a metal sculptor and repaired ski lifts at Sugarbush. His sculpture brought him to the CCO. While selling his art at the Waitsfield Farmers’ Market, Smith became friendly with the lady who sold photographs at the adjacent table. Her serene demeanor “called” him to ask her about the church. A full menu of Smith’s teas is planned for the Juniper’s Fare restaurant. This one is a mix of turmeric, cumin, thyme and cinnamon, which Father Paul attests is “for the brain.” He believes that “a whole bunch of different teas throughout the day will heal a host of ills.” Though not strong or medicinal, this brew, with chunks of fresh thyme floating at the edges, feels very much a part of the earth. Smith is excited about his new ice cream machine and plans to use the farm’s herbs in sweet treats. He proposes a concoction he tried recently — Guinness-roasted garlic. Beside his creative teas, the chef has already made his mark with Franciscan Farms’ Tongues of Fire hot sauce, for which he nurtured green chiles to make a moderately spicy but flavorful condiment from scratch. Franciscan Farms’ website offers Tongues of Fire to the world, along with homemade granola. Like most of the church’s products, the granola is sweetened with honey and maple syrup rather than processed sugars, though the chamomile flavor I sampled has brown sugar in the mix. (It’s worth it — the tea-scented comfort treat is like a warm bath.) The crunch also comes in Blueberry Chamomile, Maple Walnut and Autumn Spice. The CCO, which has 18 locations worldwide, runs missions in Kenya, Jamaica, Brazil, Hawaii and Israel. Each meal purchased at Juniper’s Fare pays for a day’s food for a Kenyan orphan who attends one of the three church-built schools in the town of Naquru. Local coffee company Brown & Jenkins offers a small bag of beans to customers who donate directly to the CCO’s Kids in Kenya charity. Bit by bit, these international experiences are infusing the cooking at Juniper’s Fare. Missionaries have returned from Brazil and Jamaica with new ideas; Smith plans to add a jerk recipe to the restaurant’s menu. Father Paul expounds emotionally on the feasts prepared entirely from local ingredients that he experienced on the Galilee, not far from the site of a church-sponsored archaeological dig. “They transformed so much of the desert into greenhouses!” he exclaims. These days, food is big business — and the organic, local food biz is on the upswing. Whether it’s cake, hot sauce or granola, food produced sustainably by spiritual folk has a double cachet when it comes to marketing.